Cape Town Bus station on Saturday the 28th of January at 6.00, 4 excited students left the Mother City to join the University of Free State in Bloemfontein. From left to the right: Buhle Mashiyi is starting a 5 year Bachelor of Law, Zintle Mtakati has been enrolled for a Baccalaureus of Social Sciences Extended programme in Human and Societal Dynamics, Cebisa Mtyhobile is studying a Bachelor of Social Sciences in Social Work and Simphiwe Simo enrolled for the Baccalaureus degree in Social sciences in Nursing. The first 2 students, Zintle and Buhle, has been part of the programme since 2008 and concretise their dreams in studying Social sciences and Law. 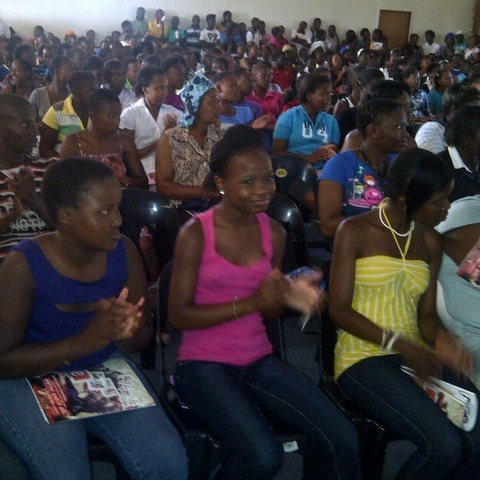 Cebisa and Simphiwe have been previously selected and interviewed by Masiphumelele Corporation to access a bursary. None of this would have happened if Professor Jonathan Jansen, Vice-Chancellor of the University of Free State, hadn’t promised to accommodate 4 students with full-bursaries. All the IkamvaYouth team is very grateful. Thank you very much for these awesome opportunities. We look forward to all four of you reaching your career goals, thanks to studying at UFS. You make us feel proud! The Makhaza Branch on IkamvaYouth has started the year sprinting! This year we have grown staggeringly to over 200 people with 170 learners and over 30 tutors, extending tutoring times to every day of the week including weekends! Already the new year has begun with some exciting projects, Khan Academy is in full swing with two Grade 9 groups participating, as well as the programme being extended to grades 10 and 11. Education Without Borders ‘Yes We Can’ maths project has also begun with the new group of grade 8s. We expect the same incredible successes as last year. English programmes have also been implemented at the younger grade levels, as well as regular tutoring and mentoring for the older grades. Matrics have begun their year with sessions identifying where they would like to be shadowing tutors in their classes later in the year as well as which institutions they’d like to come chat with them about their options. Last year’s matrics are also in the process of being places in various institutions and making sure no one is left behind this year. Last Saturday we had our first parents meeting of 2012 with an amazing turnout, the hall was packed to capacity where there was a distinct feeling of excitement and hope for the year to come. Of all the students who made it in 4 were turned away, and waiting lists are at an all time high. We also have two new interns helping us out with tutoring, admin work and setting up databases for the new students. 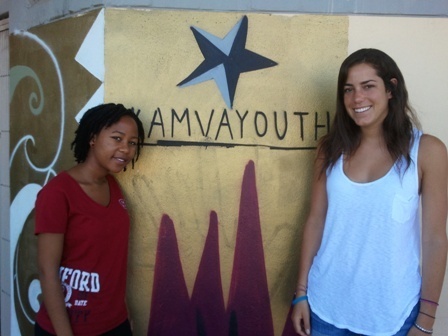 Claire Fisher and Tumisang Madigele are both currently attending the Stanford University study abroad program in Cape Town for their winter term and volunteering at IkamvaYouth. “Hi! My name is Claire Fisher, and I am from San Francisco, California in the United States. I am a third year student at Stanford University studying political science with concentrations in political theory and American politics. I am also very passionate about education reform, but my academic and experiential background pertains mostly to education in the United States. I am taking a class here on schooling and education policy in South Africa, so hopefully that will give me a better understanding of the context. I am excited to work at IkamvaYouth to learn more about education in a hands-on way, and I love tutoring, especially in algebra, English, and history! I am already impressed by IkamvaYouth’s incredible reputation, success rates, and mobilization of its students to return to the organization. I also am a huge fan of Khan Academy and am inspired by its ability to use technology to broaden access to quality lesson plans, and so the fact that Ikamvanites use it is amazing. I wanted to come to Cape Town because of its urban cityscape and beautiful mountains, and I find the cultural complexity of the city due to its historical legacy both challenging and fascinating. Good luck all our Makhaza Ikamvanites! 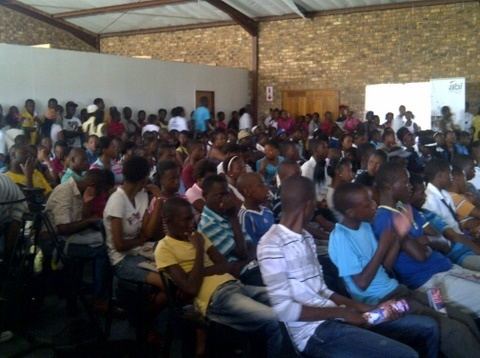 IkamvaYouth Gauteng hosted a very successful Open Day this past Saturday, 21st of January 2012, at the IkamvaYouth Centre in Ebony Park. The day started at 9:30 am with a spectacular turn out of over 700 people. 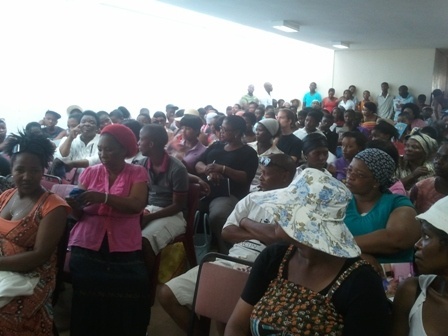 The hall was filled to capacity and there was a hub of excitement from the learners, parents, volunteers and other supporters. Several activities took place with the Branch Co-ordinator, Joe Manciya, introducing IkamvaYouth to all those who attended. He encouraged the learners to take their education seriously as their future is in their hands and pointed out that IkamvaYouth in Gauteng had opened a second branch located in Ivory Park. The day was filled with lots of information and fun, with Ikamvanites providing entertainment through music and dance. The successful Ikamvanites who matriculated in 2011 also got a chance to speak to the crowd, encouraging their peers to take their education more seriously by becoming an Ikamvanite. Several sponsors were present, including ABI and The Tzu Chi Foundation. ABI, which was represented by Beverly Selepe, their CSI Specialist, donated the branding that was used on the day, t-shirts, beverages and entertainment. The Tzu Chi Foundation was represented by Howard and announced that they had made four, R20 000 scholarships available to the 2011 successfully matriculated Ikamvanites towards their tertiary education. These successful matriculated Ikamvanites were strongly encouraged to apply. In conclusion, the Open Day was a resounding success, many of the learners took the application forms after the presentations and IkamvaYouth is looking forward to a very successful 2012 with all your continued support. 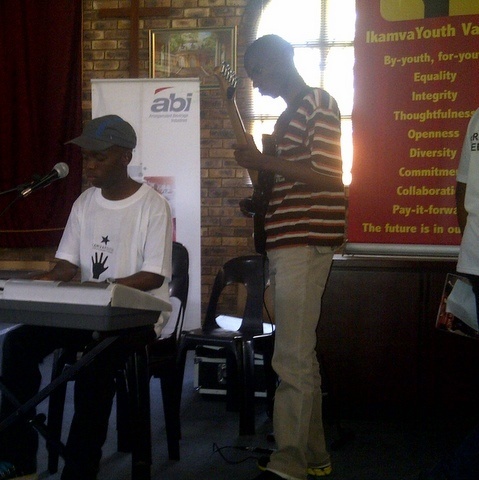 IkamvaYouth is a township-based non-profit organisation, established in 2003. With branches in five townships nationally, IkamvaYouth seeks to appoint a District Co-ordinator (KZN) based in Durban. S/he will be based at in a township, and must be a social entrepreneur who is passionate about the power of education to transform lives and communities, a person who aims to make a difference. This is an exciting opportunity to play a pivotal role in a by-youth for-youth educational movement that empowers young people to take their futures into their own hands. We are looking for graduate with work experience and a drivers licence. An individual with excellent communications skills, both written and verbal, and advanced MS Office knowledge, will feel at home in this position. A background in project management or the NGO sector will be considered but is not essential. If you are driven, reactive, flexible and able to work with others to help them reach their potential, then this could be the position for you. Email resume to: zamo@ikamvayouth.org . Nyanga Branch beats the odds! For the first time ever the Nyanga Branch has had the opportunity to experience the growth and development of the Grade 11 class of 2010 who were our very first Grade 12 class of 2011. 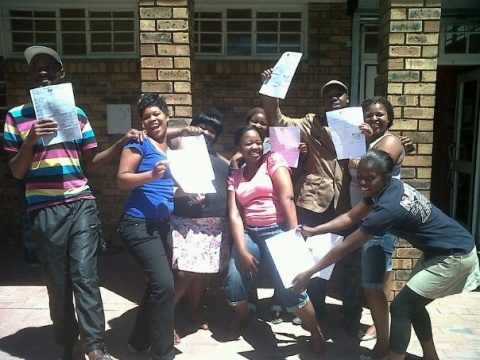 We take joy in sharing our achievement of the 2011 Grade 12 class, who have obtained us a 93% Grade 12 pass. Today we are proud to say, we too have seen the fruits of hard work and that the Future begins now! Benfilda Mwindi (on the video clip) is from Zimbabwe and came to South Africa in 2008, because she had no one to look after her back at home, while her mom was very sick and her father had come to South Africa to find employment. She is really courageous and hardworking and has surprised us time and again. Last year she lost her mother and was not able to attend the funeral in Zimbabwe, after she had been sick for a very long time but this has never been a reason for Benfilda to give up. At Oscar Mpetha High, Asanda Nanise and Anathi Malindi looking at his results. Anathi has been the true evidence that hard work pays and today his mom says “I am so relieved and happy that his future is bright”. Ananthi is in the Branch Committee and also has been the Grade Head in Grade 11 at the Nyanga Branch, he is ever eager to work harder and do more for the Branch. He has assured us that this year he will be tutor of the year. 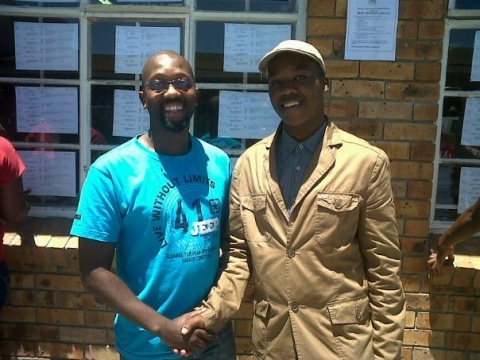 He received great news just before he received his good matric results that he has been accepted at the Cape Town University of Technology for Analytical Chemistry and his classes commence on the 17 January 2012. Anathi received a Bachelor pass. Yesterday her expression of joy and disbelief filled our small home with warmth. “Ow sis’Nombu I just can’t believe this!” these where her very first words as she walked into the Nyanga office hugging her accounting tutor (Asanda Nanise, our Branch Assistant). Benfilda passed with a Bachelor! Masande’s achievement brought tears to his mom’s eyes today. On the 21 October 2011, a day before Masande’s Business Studies exam his home was burnt down to untraceable ashes while he was in the Nyanga Library studying. Everything was burnt and all they were left with is the clothes they were wearing and the books that where in his bag. His Accounting books got burnt and he had not written accounting then. With so much determination Masande never gave up but he worked even harder. His mom today expressed how grateful she is to God saying “even though our year ended so badly but I know there is hope for my family”. Masande received a Diploma pass. We as the Nyanga Branch are very eager to work even harder and make it our mandate to deliver the vision of Ikamva Youth to the community of Nyanga East. We have learnt that the struggles of the black child are never an excuse to not achieve his or her dreams. A BIG thank you to all our tutors who have been the biggest supporters of the Nyanga Branch. The year has been very rocky and with never ending challenges but tutors made it their responsibility to make it to the Nyanga Library and help the Nyanga learners and today the Nyanga office would love to thank all of you and hope that we will continue the good work. Vuyiseka Melani “it’s not just the tutoring that makes us keep on attending at Ikamva but the support and the love we receive from all tutors”. 2012 WE ARE TAKING OVER!!! !